I still have vivid memories of her popping the head off my brand new Courtney doll. Our attempt at cosplaying for the 50th anniversary of Doctor Who back before the little munchkin was born. No, we don't normally dress like this. I promise. We get along better now. Probably because we aren't living together and touching each others stuff anymore. We got each other's back. We also share a love of thrift stores. So when she's out thrifting, she lets me know when she finds amazingness. Like this green chair. For two bucks. Because that's how thrift stores roll when they've had a chair sitting there for months and they are desperate to be rid of it. She called me while we were on vacation to see if I was interested. Who can pass up a $2 chair? It's not easy being green when you're an old chair. That 60's and 70's green...yum. A wonderful color reminiscent of avocados, snot, and baby poop. No one could see it's greatness. It needed a home. 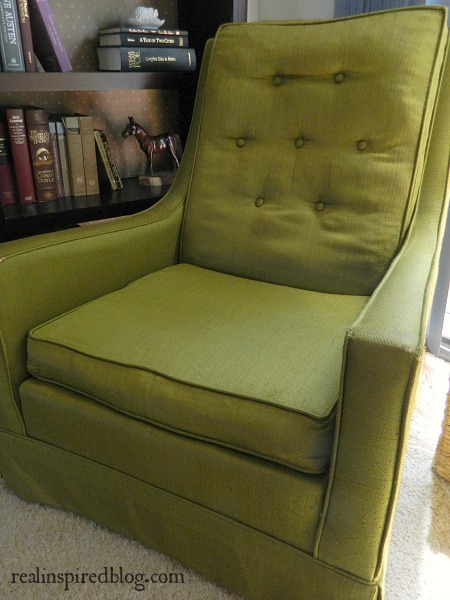 Right now it's staying green but I think it would be great to reupholster it eventually. It's in great shape and comfy so it's the perfect candidate! I'm thinking a nice nubby neutral fabric in gray, white, or cream. I'd like to do away with the skirt on the bottom and let it show a little leg too. I love leggy furniture. How would you redo it if it was yours? 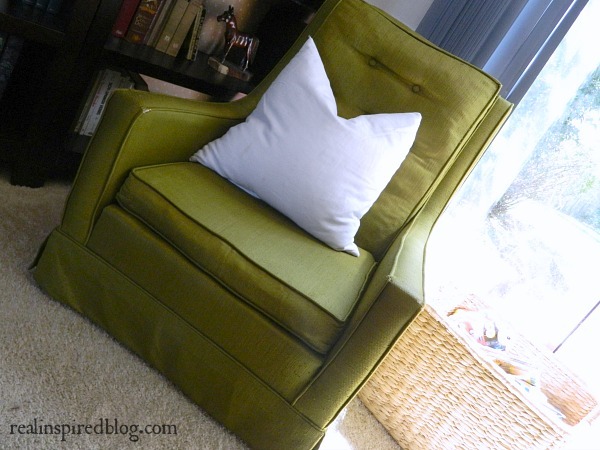 Have you had an old item reupholstered? I'd love to see a picture! Most importantly, do you happen to have an amazing person in your life that has your thrifty back?